Happy Valentine’s Day! 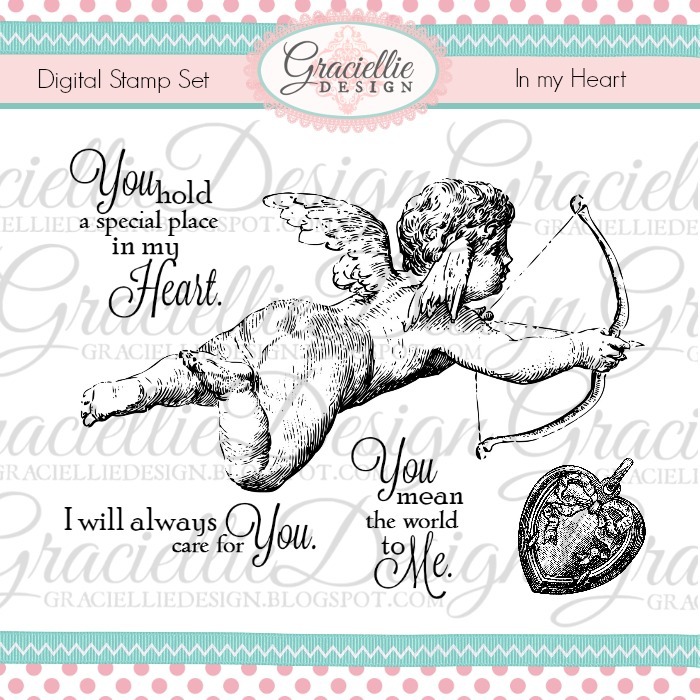 Welcome to our first Valentine’s Blog Hop at Graciellie Design. 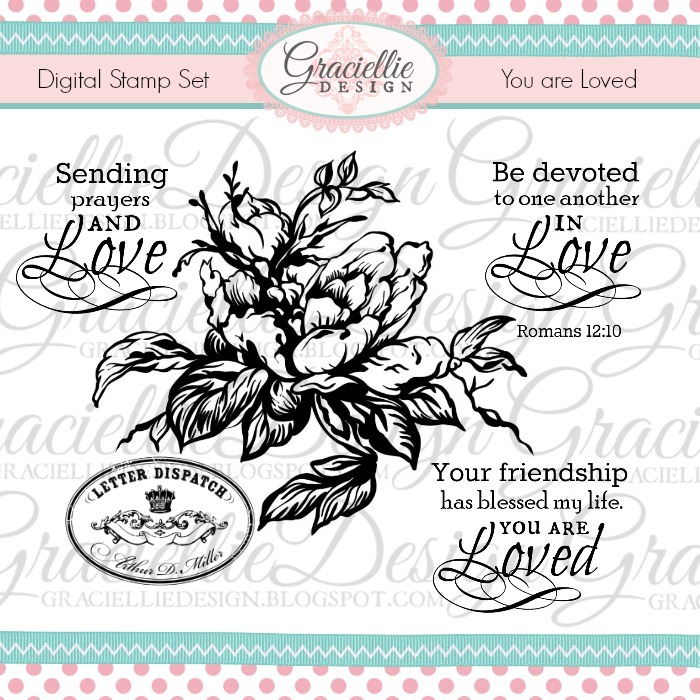 Today the Creative Team and I will be sharing lots of inspiration using our new Love & Friendship stamp collection! We also have an awesome giveaway for you so stay with us ’til the end for a chance to win! 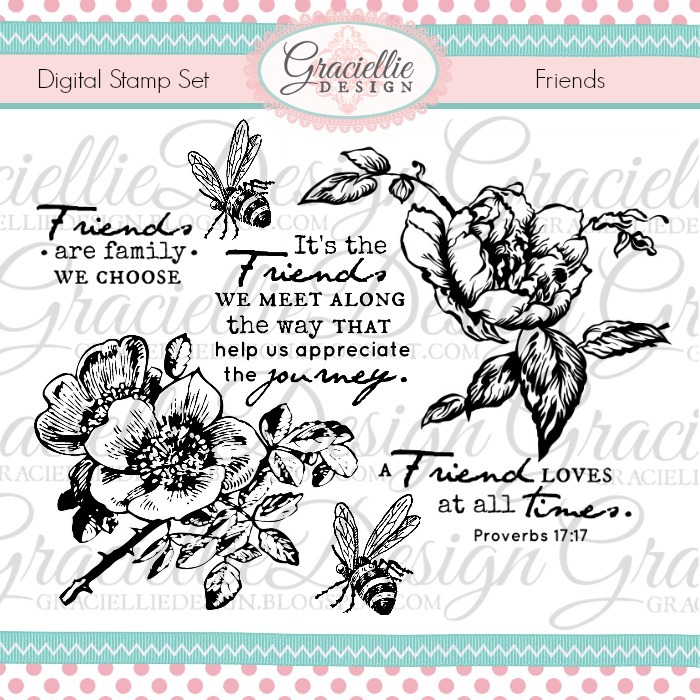 The designers and I have all been creating non-stop throughout the month making projects that include our new stamps, even for fun! 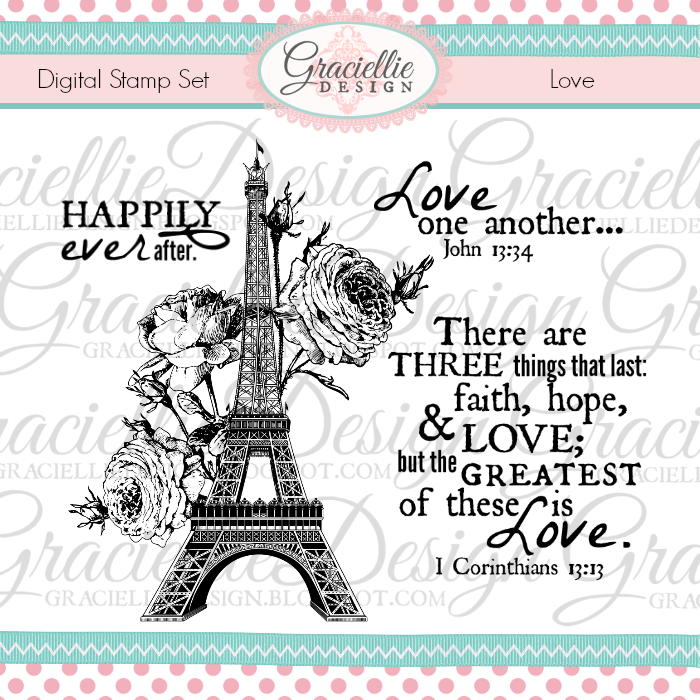 Today I’m sharing 2 sets of Valentine’s cards I made this year, one of them similar to a design featured last year using stamps from – Love Ya! 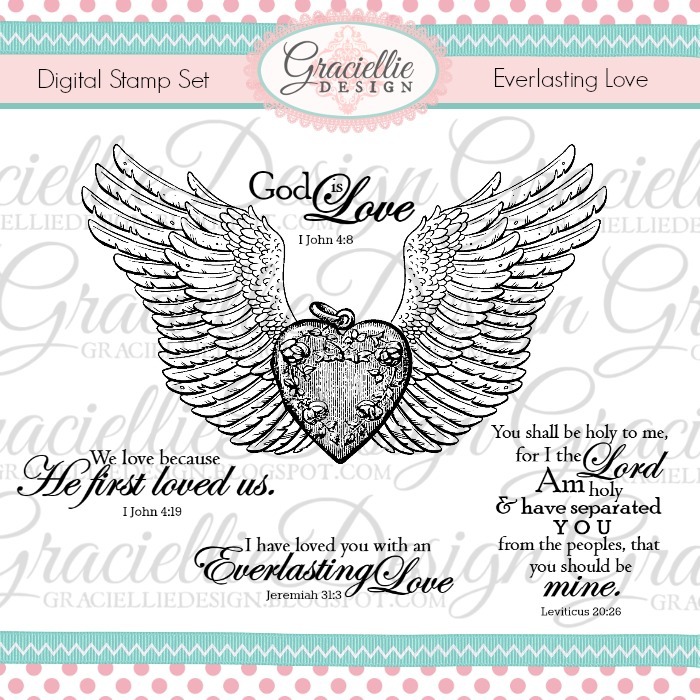 – and another one to which I added a beautiful verse from – Everlasting Love -. These fun 4 x 4″ cards are perfect to go along with Valentine’s treats. 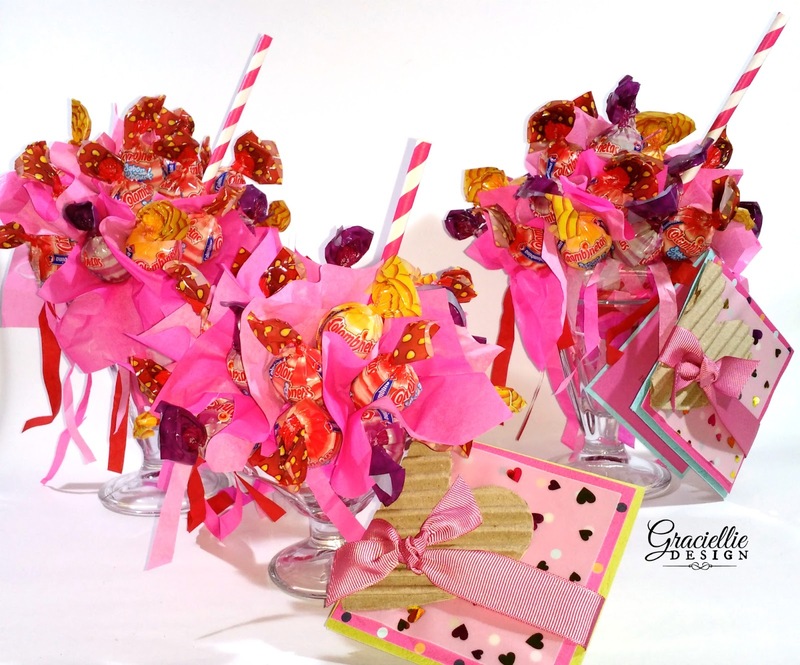 This year I made my son’s teachers these fun lollipop “milkshake” arrangements. 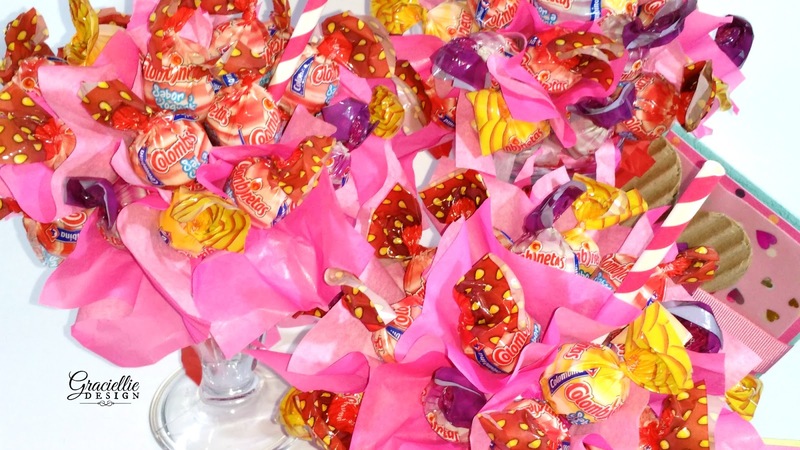 Classmates will be getting candy bags with custom made tags. The team too has lots to share with you! Today we are welcoming to the team the talented Agnieska, also known as Chanya13 in the papercrafting world. Make sure to leave a comment on very stop for a chance to win a $14 gift card to the shop. Congratulations! 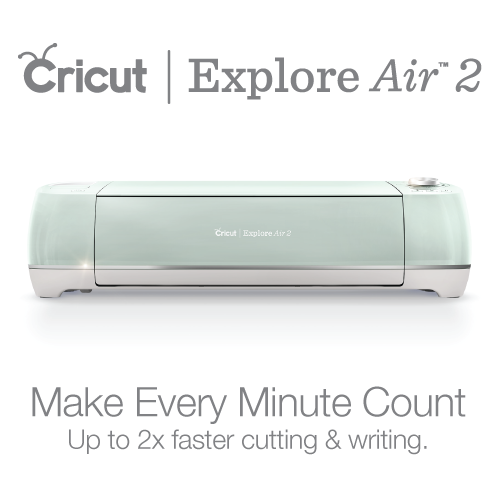 Please email me using the contact tab so you can get your prize! To all those who didn’t win, don’t give up! Next time the winner might be you, so take a minute to enjoy the inspiration and leave a comment today. 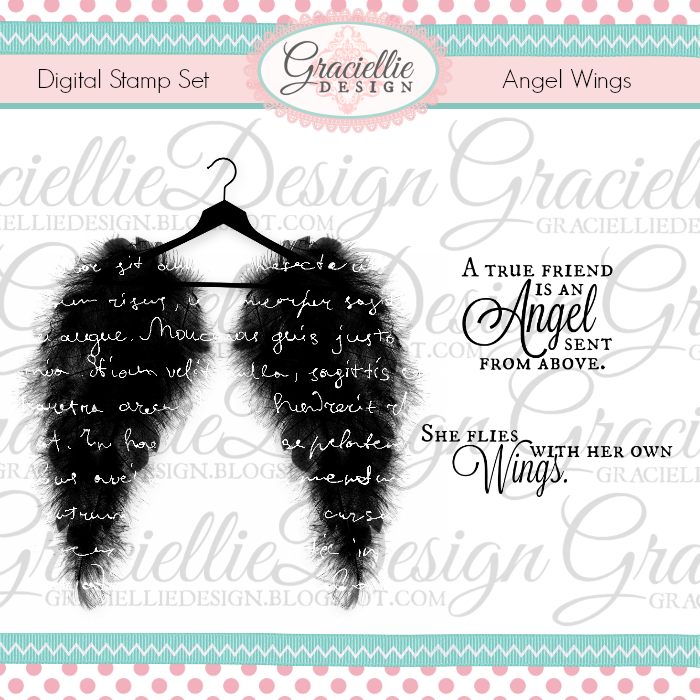 If you can’t wait, stop by the shop and take a 10% off using a coupon the designers have for you! This discount can be used as many times as you like and can be shared with friends and family. 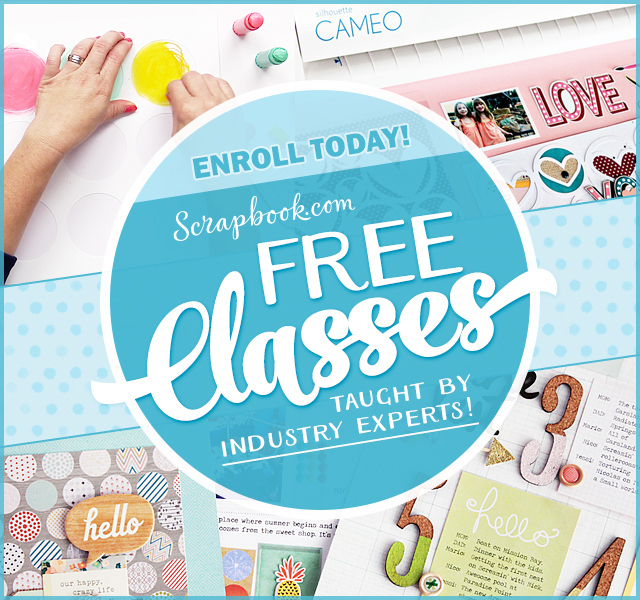 The designers will be giving away their discount codes on their blogs today. That’s it for now. We’ll be back soon with more to share. There’s an exciting new release coming and we can’t wait for you to see it! Until then, happy crafting. 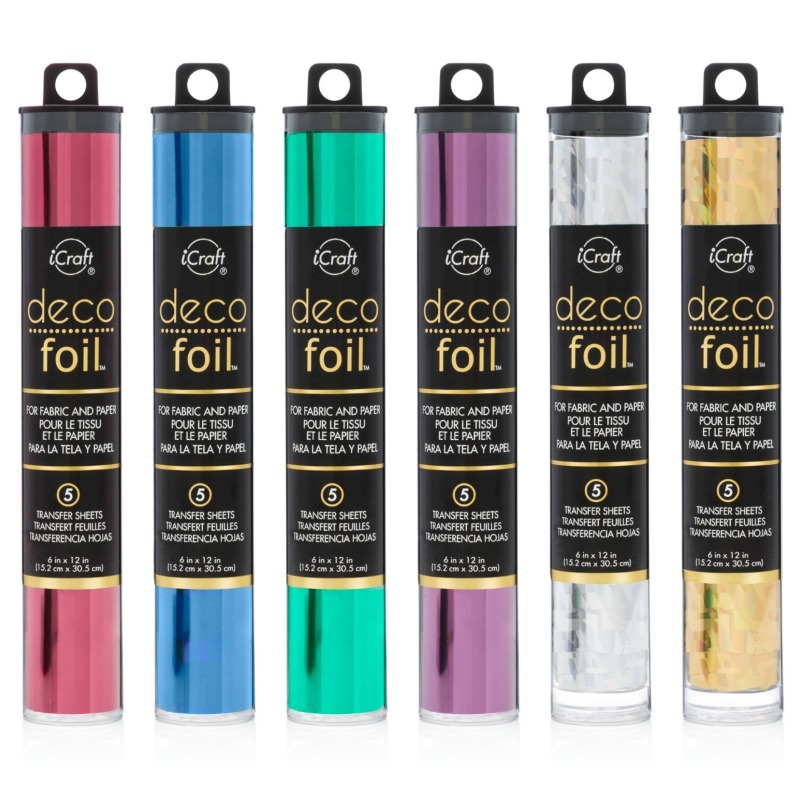 DIY Valentine’s Gift Ideas with Deco Foil Plus Exclusive Freebie! Happy Valentine Gracie. Congrats Helen. Gracie your Valentine projects are so fun and festive. Happy Valentine's Day! Beautiful projects Gracie. Happy Valentine! Happy Valentines Day Gracie! As always your creation take us all to a new level of creating! I love your products and your teaching!! Happy Valentines Gracie. Gorgeous projects. Thanks for sharing and congratulations to Helen. Thanks for sharing beautiful projects. Beautiful projects 🙂 I love the hot pink!! Happy Valentine's Day!! 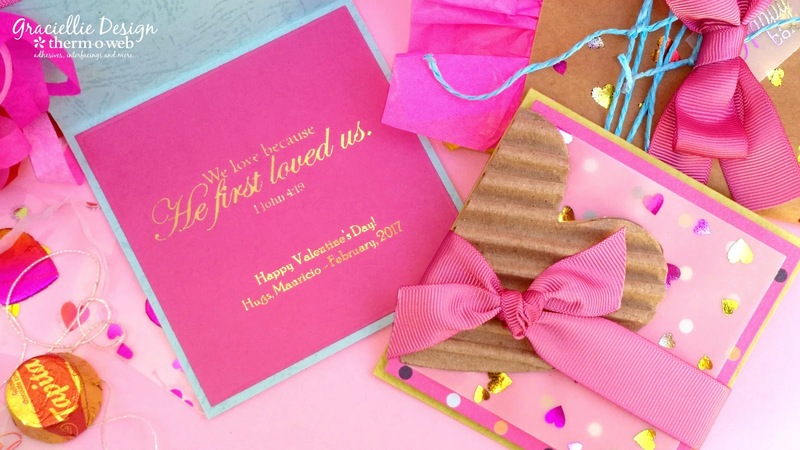 Your Valentine milkshake gifts are beautiful and the cards are just gorgeous. And I have sent you an email, Gracie! Thank You so much! 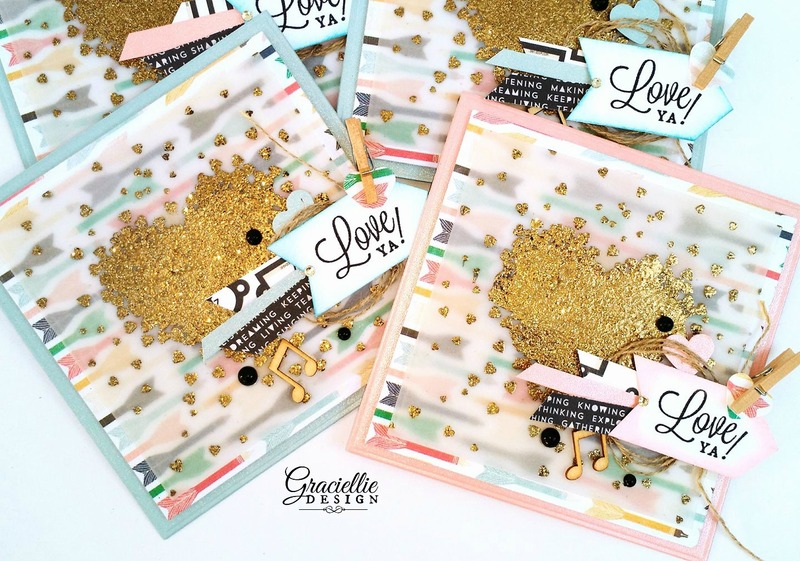 LOVE your cards, the designs are FABULOUS and your glorious golden hearts a DELIGHT! More gorgeous projects! Thanks for joining us – again! – at Naughty or Nice Challenges! Thy are amazing! Thank you so much for playing along at CWS Challenge this month. Beautiful cards 🙂 Thanks for playing along at Pixels and Paper! ATX Web Designs a Austin Web Design, Digital Marketing Company. Growing Businesses, Transforming Brands. The mobile device or tablet you’re holding in your hand, or the desktop screen you’re looking at right now is the golden key to unlocking the growth your company needs. We are a high-level web design & digital marketing agency in Austin TX specializing in SEO, PPC, web design & development that increases your business revenue. This is such a nice post you have shared. because everyone wants to make their valentines day unforgettable. Simple, loving and beautiful ides you have shared with us. I just loved it and I want to say thanks to you for providing this type of information.